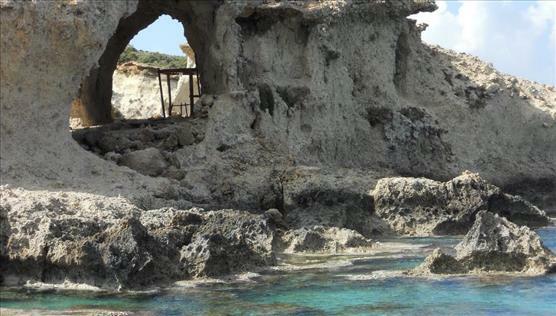 The current name “Koufonisi” is related to the many pits and caves shaped by the sea and the rain in the soft rocks. As excavations revealed, the island flourished the Roman times. The proof is a theatre found there with a capacity of more than 1,000 seats. During ancient times, it was an important spot for sponge fishing and the processing of Tyrian purple, the renowned red dye used by the Ancients and Byzantines, which was extracted from the gastropod Murex brandaris. The island is of strategic importance because of its position and was claimed by both municipalities of Itanos and Ierapetra, but was ultimately given to Itanos. Excavations during the last century brought astonishing findings to light. 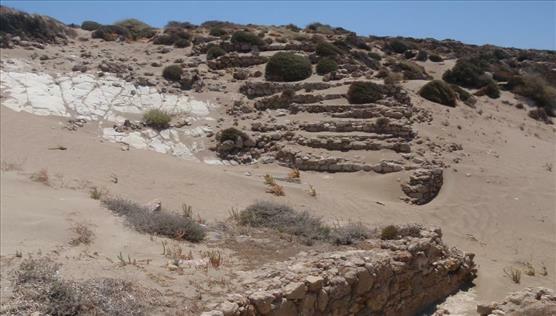 Among others, a stone theatre, the southernmost ancient theatre in Europe with a capacity of 1,000 seats and an important settlement which was looted and destroyed during ancient times. A large villa with eight well maintained rooms was also discovered, as well as another house in the settlement with 16 rooms. The most important finding, however, is the Roman the public bathhouse, which was in use from the 1st to the 4th century AD and was luxuriously decorated. A temple was even found on the south of the island, but it was not maintained and after thousands of years it was destroyed in 1920 and replaced by a modern lighthouse. Some parts of the temple, such as parts from the worship statute, have been embedded in the walls of the lighthouse. In early Byzantine times, the island served as a hermitage for monks, who used to carve images of saints and inscriptions in the Latin language in the caves on the south coast. One of the inscriptions indicates the date 1638. Lastly, on the north side of the island, there is a beautiful little church dedicated to St Nicholas, the patron saint of sailors. Today, the island is a refuge for fishermen during the strong winds and the storms of the Libyan Sea. In recent years, its rich history and diverse environment have been studied and recognised. This knowledge is now shared with visitors, who are obliged to respect and protect the beautiful islands.